This summer, ASCE members will be casting votes that will affect the future of the civil engineering profession. Beginning June 15, the process begins for electing new ASCE national officers, including president-elect, region and at-large directors, and region governors. 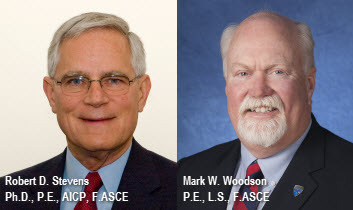 Robert D. Stevens, Ph.D., P.E., AICP, F.ASCE, and Mark W. Woodson, P.E., L.S., F.ASCE, have been selected by the Board of Direction’s Nominating Committee as the two official nominees for the position of ASCE’s 2014 president-elect. To give you better insights into this year’s nominees, Anne Elizabeth Powell, editor-in-chief of Civil Engineering magazine, interviewed the two nominees and asked them 13 questions that focused on topics of current importance to the Society. These are the responses of the two nominees. 1. What best qualifies you to serve as ASCE’s president? 2. What do you believe should be ASCE’s primary focus in the year ahead? 3. What do you see as ASCE’s primary challenges in the year ahead? 4. What do you hope to accomplish in the year ahead? 5. How can ASCE’s strengths be further optimized? 6. How can ASCE strengthen its ties to members? 7. What can ASCE do to draw more people into the profession, especially more women and more members of minority groups? 8. Is there anything ASCE can do differently to serve the 21st-century engineer? 9. What do you believe is the single most important objective the civil engineering profession must achieve within the next five years? 10. What do you believe is the single most important objective ASCE must achieve within the next five years? 11. What should ASCE’s role be in influencing public policy? 12. In specific terms, how can ASCE build on our three strategic initiatives: raising the bar, infrastructure, and sustainability? 13. What can ASCE do to strengthen participation from younger members and ensure that they remain engaged with ASCE throughout their careers? STEVENS: My desire to serve and my active participation in ASCE from student member days at the University of Akron till now as a life member. My experience includes: (1) service on 40-plus Society, Section/Branch, and Technical committees; (2) participation on various boards including ASCE, Engineers Without Borders (EWB), ARTBA, homeowner associations, school, zoning, and transportation; (3) professional experience in the U.S. and 10 other countries; (4) member of the committee that led to the creation of the Transportation and Development Institute (T&DI) and subsequent service as T&DI’s treasurer, vice president, president, past president and chair, Administrative Council; (5) elected Technical Region Director and serving on the ASCE Board of Direction from 2009 till 2012; (6) a member and chair of the Technical Region Board of Governors and a liaison with each of ASCE’s 8 Institutes; and (7) chair of the Committee on Technical Advancement. I’ve lived in 6 of ASCE’s 10 Geographic Regions and have worked on or overseen project teams in all 10 Geographic Regions. I’ve been a local member in Akron; Ann Arbor; Chicago; Taipei; Orange County, California; Denver; and Fort Worth. I’ve been to over 100 countries. I’ve worked for city government and consulting firms and taught part-time at Michigan, Akron, and Cleveland state universities. I’ve served on ASCE’s Audit, Strategic Planning, Program and Executive committees and as a Key Contact. My desire to serve is supported by my family. WOODSON: Theodore Roosevelt said “Every man owes a portion of his time and his income to the business or industry in which he earns his living,” and I believe in this statement. I have been actively involved with ASCE for over 30 years, at the geographic, institute, and professional levels, starting in 1983 as the Southern Arizona Branch President. For more than a decade I have been active at the national board level as District 11/Region 8 Director, treasurer (chair of the Finance Committee), and chair of the Strategic Planning Committee. I have also been involved with numerous task- and board-level committees. 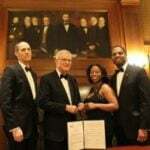 I am currently Governor on the Board of the Transportation and Development Institute and a member of the Committee on Leadership and Management. In addition to my service to ASCE, I have held leadership roles in other professional organizations and in my community including participation on many committees and community boards. I have spent the past year as a member of the Flagstaff City Council. Involvement is how we as members of our communities can help to shape the future. Our profession must ensure that the planning, design, construction, operation, and maintenance of infrastructure are a priority in private and public projects of the future, while also helping to provide solutions to repair or replace the aging infrastructure that our communities have to deal with today. We need to continue to educate the public and governmental entities as to the importance of sustainable infrastructure and how it affects our economic well-being and quality of life. It is essential that we continue to work with the public to raise the awareness of the benefits of increased educational requirements to be a professional engineer. ASCE is best suited to provide the public with a better understanding of the profession, the work that we do, and how it affects their lives. We need to continue to engage and mentor members to be involved and to participate through leadership roles throughout the organization; at sections, branches, committees, and technical groups. We also need to be providing services that are beneficial and provide value to all types of members and their various personal and professional needs. STEVENS: Continue to advance our three strategic initiatives: (1) Infrastructure: continue promoting the recently released Web app of the 2013 Report Card for America’s Infrastructure and the Failure to Act reports to inform elected officials and the public; (2) Raise the Bar: broaden our coalition and focus on getting the first state to pass legislation; and (3) Sustainability: offer training to our members and promote the Institute for Sustainable Infrastructure (ISI) and Envision. STEVENS: There are three: (1) membership growth, including attracting more student, younger, and former members; (2) offering more member services and programs; and (3) identifying new sources of revenue to reduce the need for dues increase. 1 ) Membership value continues to be a challenge, especially in these economic times. Throughout my term on the ASCE board, I have worked to ensure that we provide the greatest services and benefits to our members. With changing economic conditions, technology and membership diversity, this remains a challenge that we need to stay focused on. 2) Our international membership continues to grow and we need to continue to develop this part of the organization. When we look to the future, we can see an ASCE with as many international members as we have within the US. The recent Task Committee on Global Strategy report to the Board outlines steps on how we will better engage this membership. We need to follow-up on the recommendations of the committee and develop actions to achieve a global ASCE. WOODSON: As president-elect, I hope to meet with section, branch, and technical groups to better understand their needs. From this I plan to work with ASCE leadership to review existing programs or to develop new ideas to better meet the members’ needs. Meeting with these groups also provides an opportunity to work with and engage the future leaders of ASCE. STEVENS: Listen to members to learn what they want from ASCE and talk with them about the many ways there are for them to be involved: participating in a society committee, a section or branch, a technical group or an institute. There are so many opportunities. I want to get the word out to make sure our members know about them. STEVENS: ASCE is recognized as the premier civil engineering organization globally. This is due to: (1) our 140,000-plus members, many of whom volunteer service to ASCE; and (2) our staff that supports the programs. Adding members, getting members more actively involved, and increasing the number of donors and their willingness to support ASCE and the ASCE Foundation by conveying to them the benefits of joining and supporting are critical to success. WOODSON: ASCE is the premier organization for civil engineers. We have many strengths including: active local groups, growing global and diverse membership, premier technical groups and activities, active engagement for students and younger members, et cetera. We need to continue to work toward a more diverse membership and extend this diversity to our leadership positions. We have accomplished a lot with mentoring and diversity awareness programs and should continue to do more. We can engage more civil engineers to be members by providing strategic benefits that enhance the members’ personal and professional lives. We need to develop more programs that introduce civil engineering to younger people so that they can experience the work that we do and experience the fun and enthusiasm in the work we do that will lead them to a career in civil engineering. WOODSON: We need to continue to encourage all levels of members to gain technology and leadership skills through the ASCE education programs. By working together we can strive to meet their professional needs, as they transition through their professional careers, and strengthen our industry and our members’ connection to our profession. STEVENS: Offering more member value is key. This can be done by effectively communicating with members and making sure that we offer them what they want throughout their careers whether as students, younger members, members, fellows, or life members. Benefits must be relevant while they study, teach, conduct research, plan, design, construct, or manage. Communications with members must be excellent. To do this we need to offer the best civil engineering Web site, transition to paperless and open publishing, provide more on-line training at lower costs, promote our great profession that’s open to all and growing in diversity, and work more closely with related professional organizations as we jointly promote our common interests. STEVENS: We need to tell our story loud and clear by getting the message out to elementary and secondary students and their parents and teachers that there are great opportunities available in civil engineering for anyone who wants to help make people’s lives better and safer, and by drawing attention to our supporting relationship with EWB where projects can be done around the world. EWB’s membership is younger with a much higher percentage of women and other minorities than ASCE’s. The profession is changing for the better. WOODSON: We need to continue to reach out with programs in elementary and high schools showing the excitement and creativity of our work and demonstrate how engineering impacts their world and environment. Mentoring opportunities in school programs can emphasize how being an engineer is a way to protect the environment and have a positive impact on the world while providing a very rewarding career path. And we need to ask our women and minority members what more we can do to accomplish this important goal. WOODSON: YES – and this is our ongoing challenge. Technology is changing how we work, how we communicate and how we do just about everything. The rate of change is phenomenal and unprecedented. ASCE will have to continue to provide the programs and services to our members in ever changing ways. More important is the role that we can play in helping our members keep up with the rate of change. This is one of the most important services that we should provide for our members both now and in the future. And we will need to do this globally, not just locally. STEVENS: We’re already doing some things differently. With technology changing at an increasing pace, our members need to be able to rely on ASCE as a great information source. We need to take more advantage of the growing use of social media and use it more effectively to communicate with our members and others, hold some virtual conferences to minimize travel costs and allow more members to be involved, provide more training opportunities online, and publish news and journal articles online to speed up the delivery of information to our members. We also need to work more closely with other organizations that serve segments of civil engineering to jointly promote the interests of the profession. STEVENS: Civil engineering has a long history. Throughout that history, civil engineers have provided the infrastructure and facilities that people need to live safe and healthy lives. Much money has been spent to plan, design, build, operate, and maintain the built environment. Finding the funds to do this has never been easy. Doing more with less and doing our work in sustainable ways are of growing importance. Therefore, the single most important objective the civil engineering profession must achieve is to work together with others to make the public and elected officials aware of the desperate need for funds, whether public or private, to allow us to continue to provide, operate, and maintain the infrastructure and facilities that we as civil engineers are so capable of doing. WOODSON: Civil engineers must help the public understand the importance of infrastructure in their daily lives and their communities and the role we play in providing sound and sustainable infrastructure. WOODSON: ASCE will need to continue to educate government officials and the public to better understand the importance of infrastructure in their daily lives and their communities. With a public infrastructure and sustainability message we can impact our economy and increase the quality of life in our communities. Our members need to educate and influence public policy. Our profession is the leader in the field of infrastructure and sustainably and can demonstrate the positive impact it has on our world through community involvement and education. STEVENS: ASCE must continue to promote the need for infrastructure and facilities to be provided and properly maintained through the use of the 2013 Report Card for America’s Infrastructure and the Failure to Act series of reports. To do this most effectively we must work together even more with our coalition partners and with other organizations that also recognize the value of infrastructure and facilities for the good of the public. With ASCE as the globally recognized leading organization for the civil engineering profession promoting this it: (1) draws attention to the value of the profession; (2) promotes the profession as one that helps people live better by protecting public health, safety, and welfare; and (3) attracts a diversity of students to the profession by letting students and parents know that a civil engineer has a great variety of career choices and many different opportunities whether they be in government, education, research, consulting, construction, or management. As we promote the need for infrastructure, ASCE will help get students to choose the profession so as to meet the demand for new civil engineers and further increase the diversity of the profession. STEVENS: ASCE must influence policy. One could ask, if we don’t who will? Clearly we must do it to make sure that what we stand for as civil engineers is conveyed to our elected officials at all levels. To do this we must continue following our very effective procedures for developing new and reviewing existing policies on a regularly scheduled basis. Having clear policy statements that are agreed upon and adopted are essential for our members, the public, and our elected officials to know exactly where ASCE stands on all of the issues that civil engineering is involved in. With these clear policies, our legislative staff and members who convey our messages to elected officials know what position we have taken and can speak with one voice so that we’re not contradicting each other. Also our members who choose to be Key Contacts can know clearly what our positions are and can make use of our policies as they engage with others. WOODSON: ASCE needs to be at the forefront of educating the public and policy makers with regard to infrastructure and the benefits that it provides to a vibrant civilization. ASCE can continue to help our members influence government policy by providing information and tools for meeting with government officials and our elected representatives. As I state in my vision statement, I have gone a step further and became a city council member. I would encourage more of our members to consider doing something similar to have a greater impact on public policy. a. Raising the Bar – It is essential to encourage all professional engineers and engineers in training to continue seeking educational and professional development and provide these opportunities to our members. b. Infrastructure – We have done a tremendous amount of work at the federal level and we now need to create local and state funding scenarios that our members can propose within their communities and ensure our government officials and the public understand the benefits of sound infrastructure and how to pay for it. c. Sustainability – We must continue to promote and engage the Envision rating system. We also need to reinforce the many practices that we’ve utilized over the years and recognize them for their role in sustainability. STEVENS: While all three of these strategic initiatives have been rolled out and some progress has been made on each of them, there is still a lot of work that is needed to be done before we can say any of the three has been completed. For raising the bar, we’ve made progress in getting many of our members to agree that it is important for the future of the profession. We need to build an even bigger coalition of our sister organizations and university faculty and deans to support it. NCEES has adopted a model law based on Raise the Bar. We now need a success by getting the first state licensing board to adopt the model law. For infrastructure, we’ve made a lot of progress. We’ve got great tools in the 2013 Report Card for America’s Infrastructure and the Failure to Act series. These provide valuable information that shows what is needed and the consequences of not acting. We need to continue to get the word out. For sustainability, we need to continue promoting the training that we offer our members and that ISI offers as well as the use of ISI’s infrastructure sustainability rating tool, Envision. STEVENS: The more students that transition from student member to associate member, and the more associate members we can keep involved the more we increase the likelihood that they will stick with ASCE for life. The younger member groups have helped get more younger members involved. Encouraging them also to establish connections with local section/branch and technical groups as well as the institutes will help make their engagement permanent. WOODSON: Engaging younger members ensures the future of ASCE. We need to keep them engaged during their transition from college to the profession. We have been working for years to manage this transition and continue to improve on maintaining the necessary relationship. We also need to provide them mentoring and “how to” opportunities that will help them learn important elements as they start their careers. We want them to enjoy the exciting opportunities and get to meet other engineers through networking opportunities. We may also want to look at the need to accommodate younger members’ extra busy lives when they are starting a family and their career, when they may want some “time off from ASCE”. We can help them then by letting them know that we will gladly “welcome“ them back when they’re ready to re-engage.